Property Size 448 sq. ft. Location, Location, Location. The Creekside Condo offers relaxation and comfort after charmed days spent enjoying the National Parks and the abundant activities the Valley has to offer. A unique combination of Downtown access but quietly located adjacent to Flat Creek and Saddle Butte Mountain makes this the perfect condo for your stay. The charming Creekside Condo features all new furnishings with designer granite countertops in the kitchen and bathroom with modern styled art throughout. The Creekside Condo is located 2 blocks from the Town Square and provides Western charm in a one bedroom, one bathroom condo adjacent to Flat Creek and Saddle Butte Mountain. The location can provide a truly unbeatable experience situated on the 1st floor at the end of the Brookside complex facing Flat Creek and Saddle Butte Mountain. Enjoy the peaceful outdoors being creekside where you will see Swans, Geese and Ducks wading by amongst the large Willow trees and grassy banks. This Creekside Condo is in the center of restaurants, galleries, nightlife and ample shopping in Jackson. 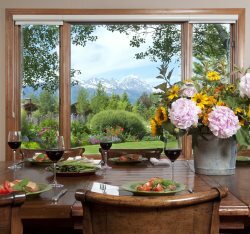 Enjoy the convenience of being only 5 minutes to Snow King Resort, 15 minutes to Grand Teton National Park, 15 minutes to Jackson Hole Mountain Resort and 57 miles to Yellowstone National Park. A bus that stops near the condo can take you to Snow King Resort and Jackson Hole Mountain Resort if you prefer. The Creekside Condo offers relaxation and comfort after charmed days spent enjoying the National Parks and the abundant activities the Valley has to offer. A unique combination of Downtown access but quietly located adjacent to Flat Creek and Saddle Butte Mountain makes this the perfect condo for your stay. The Creekside Condo faces a large communal lawn space with barbecue and seating. Enjoy a glass of wine listening to the sounds of the water and come back to the unit, which offers contemporary western décor and modern furnishings. Let us invite you to experience what is special about this Rustic Creekside Condo located in a special setting near Flat Creek and Saddle Butte Mountain. View the pictures to appreciate what is waiting for you at this Creekside Condo. From your assigned parking space you will walk a short distance to the front door of the condo. Outside of the condo’s front door you will see Flat Creek, Aspen trees and shared lawn space with communal seating and barbecue. Once inside the Creekside Condo you will enter into the living and dining space with a 42” flat screen TV, comfortable seating and a 2-person dining table. Straight ahead is the fully stocked kitchen with beautiful granite counter tops and modern appliances. Pass through the kitchen to find the bedroom featuring a Queen size bed with a new hypoallergenic bamboo mattress and ensuite full- sized bathroom. Relax on the double reclining love seat after a day of activities while watching a movie on the 42” flat screen TV and the flickering flames in the fireplace. Decorated in a contemporary western style with hardwood floors and large windows on one side allowing for the entry of natural light and the opportunity to see the View. Decorated with a real cowhide rug, accent pillows, and contrasting black and white furniture. Enjoy a meal or your morning coffee at the dining nook that seats 2 people. The kitchen features beautiful Granite countertops, hardwood floors and honey-colored wood cabinets. A fully-stocked open kitchen with lots of cupboard space and modern appliances makes meal time a breeze. The kitchen comes equipped with crockery, cutlery glassware, coffee maker, toaster, blender, pots, pans and cooking tools. Featuring a Queen size hypoallergenic bamboo mattress topped with 300 thread count sheets, comforter and 4 pillows. A modern metallic bed frame with sleek nightstands on either side of the bed rounds off this room. The floor is carpeted and the room offers ample closet space. The full size ensuite bathroom is accessed through the bedroom. Offering a granite-topped vanity, toilet and shower/bath combo. A stackable washer and dryer combo are conveniently located behind the door.